The first in a series of three recipes featuring a common key ingredient. For our inaugural series we will be focusing on an oft overlooked herb: Mint. Normally, I am not a huge fan of the pungent herb because it is used too heavily in recipes. Personally, I like a hint of mint. If used correctly, though, it can really add the perfect subtle flavor to a dish! 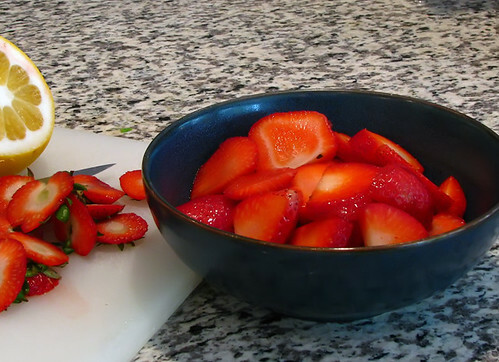 Rinse and drain strawberries. Remove stems and slice lengthwise about 1/4″ thick. Place into bowl. 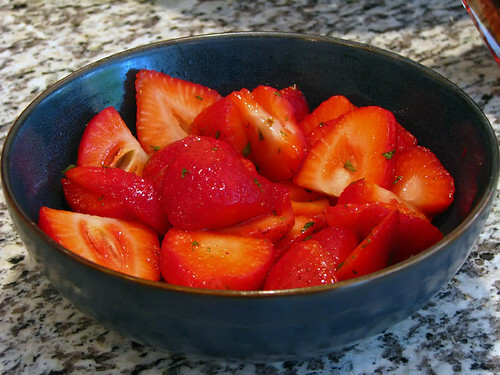 Sprinkle minced mint over berries. Squeeze juice from lemon over berries (be sure to remove seeds first or squeeze juice through a strainer). Pour cognac over berries. With a spoon mix gently, but well. NOTE: I don’t want to sound like a “Lemon Snob”, but there really is only one type of lemon to use for this, or any, recipe: a Meyer Lemon. Their sweet, tangy flavor adds so much more to any recipe calling for the yellow citrus fruit. 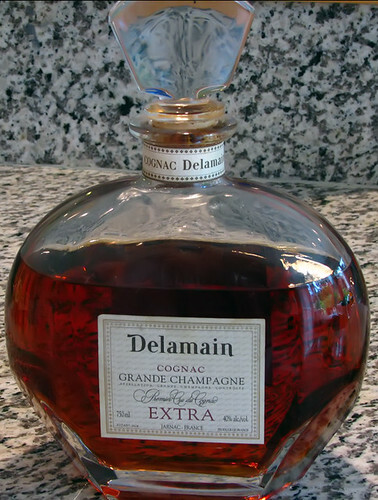 Again, not wanting to sound like a snob – this time a “Cognac Snob” – but, Delamain is the be-all, end-all brandy. It is an amazingly complex yet pleasing nectar, whether you are sipping it or cooking with it. And, yes, quality ingredients really do make a huge difference. Once thoroughly mixed, cover bowl and refrigerate for 1-2 hours. These are great solo; with ice cream; or, as pictured below, with your favorite piece of cake. Here they are paired with a Cheese Filled Crumb Coffee Cake. Yummmmmmmm! 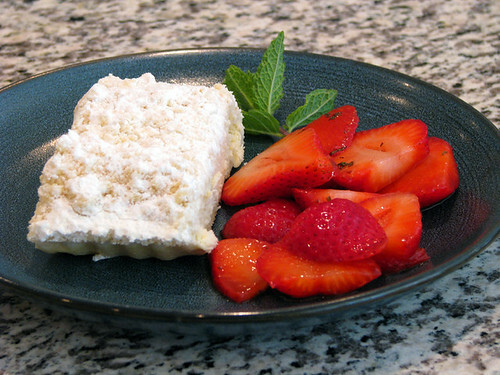 This entry was posted on May 18, 2010 at 5:55 AM	and is filed under Desserts, Secret Ingredient Series, Side Dishes, Vegetarian. Tagged: cognac, cooking, food, fruit, mint, strawberries, strawberry. You can follow any responses to this entry through the RSS 2.0 feed. You can leave a response, or trackback from your own site. 😆 Yeah, it’s good with S-berries, Drick! Funny you say that, Cristina. We just discovered all this wild mint growing in the backyard of our new Cave. Which is what inspired this series … hope you like the rest of the recipes. Mint is in my yard, strawberry season is almost here and it’s always cognac season. Delicious! Would home made cognac work 😛 My dad makes cognac every now and then and there is a bottle maturing somewhere. I agree about the mint, it can be overwhelming, I usually prefer the dried version. Try these fresh mint recipes, Viviane. I promise they aren’t too minty! 😆 Ours is going crazy in the back yard! Mmmm! Those berries look devine, pass the plate please!